An average Mac user should not have any major problems. Read benefits and areas of improvement. Keeping in mind the customer value proposition, renting vs. buying, buying trends, etc. It's subjective, but I like it. Red Dot agrees. 5/5 for responsiveness. 3.5 for language skills. To learn more about what others say, you can check some of these Setapp Reviews on MacPaw's Homepage. I have checked them all - and many others - and I am pretty confident that my review is unbiased and honest. Not listed there, MyMac rated Setapp at 9/10 in Dec 2017. Setapp has a nice outlook to start with! Simple. Clean. User-friendly interface. The color choice is also good. A logical menu is also noticeable. 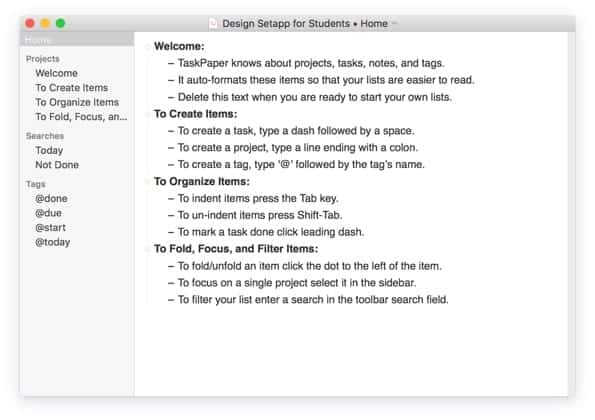 Setapp by MacPaw is 'a new approach to app subscriptions,' as described by The Sweet Setup. 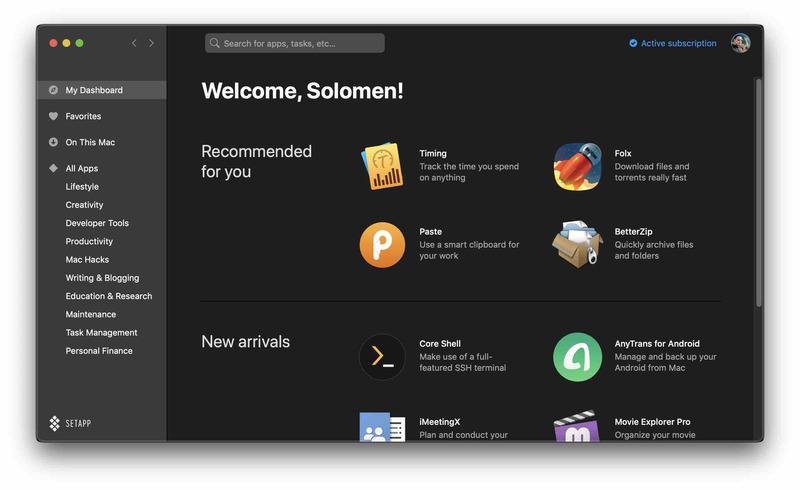 It can be seen as a scaled-down version of, if not an alternative to, the Mac App Store as it provides numerous handpicked apps in various categories from several developers. As long as you are a subscriber to Setapp (monthly or annual plan), you can use any app on up to two of your Macs. For a flat monthly fee of around $10, you have access to 178 (and counting) apps in various popular app categories. On top of that, you get to use the premium version of any app you choose to use, and there are no in-app purchases for unlocking features. And, there are no ads! 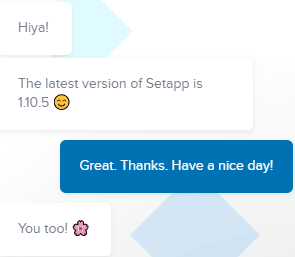 Termed as the 'Netflix of apps' by many and 'Spotify of apps' by many others, Setapp has more than 15,000 paid subscribers so far, according to a Jan 14, 2018, TechCrunch article. Around 300,000 people have signed up for a free trial. Around 500 Mb of free space. Setapp offers three subscription packages. Setapp has done a decent job so far when it comes to covering the various categories of Mac apps. Keeping in mind their business model (more on that later), it seems hard to attract the top guns; the likes of Microsoft or Adobe, for example, to hop in. So, the apps collection may not be the best of the best, but it certainly is not the worst. There are a lot of cool, useful, and relevant apps for an average Mac user. For a full list of categories and apps included in Setapp, you can visit the Setapp collection. For a glimpse of some apps included in Setapp so far under different categories, scroll! 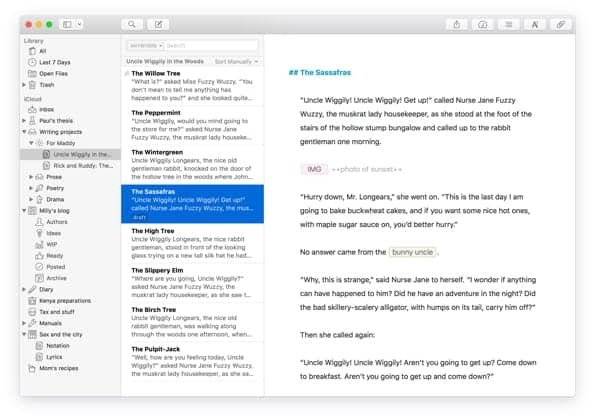 For writers like me, apps like Ulysses are a great option to try. Different Mac users have different tastes, so it comes down to personal preferences. You can try Ulysses and see if it's for you or not. Do share your experience. Mac slowing down? 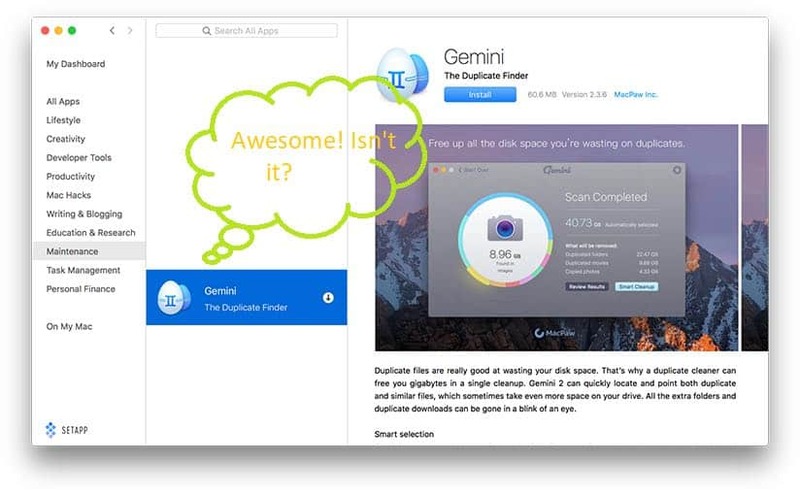 Setapp has an app called Gemini 2 that will help you find duplicate and similar files on your system so you can see and remove them and enhance the Mac performance. Gemini 2 is the winner of Red Dot award 2017 for UI design. Version 2.4.2 of Gemini is the latest version, to date. With Setapp, you'll always get the latest version of any app. Awesome, isn't it? 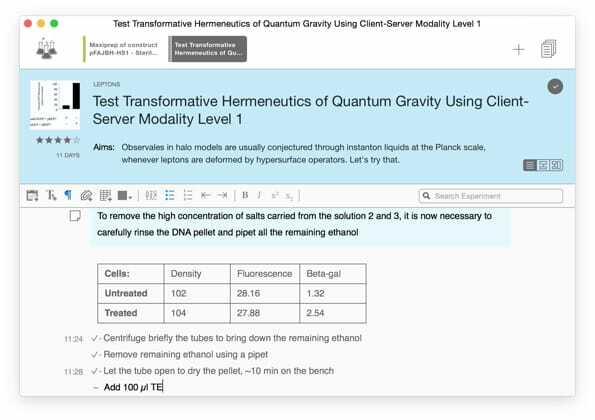 Quick and precise research tracking tools of Findings app in Setapp help put things in order. Do productivity apps really help? Many people think so! Multitasking, no matter how hard it seems, is possible. Not just possible, often times, it's essential for enhanced productivity! 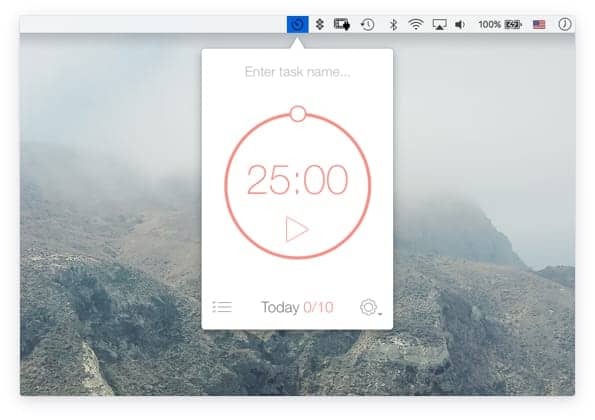 Setapp has several apps to help you become more productive. Be Focused, for example, is an app that helps you schedule your day according to your goals so you can finish your work on time. Okay! 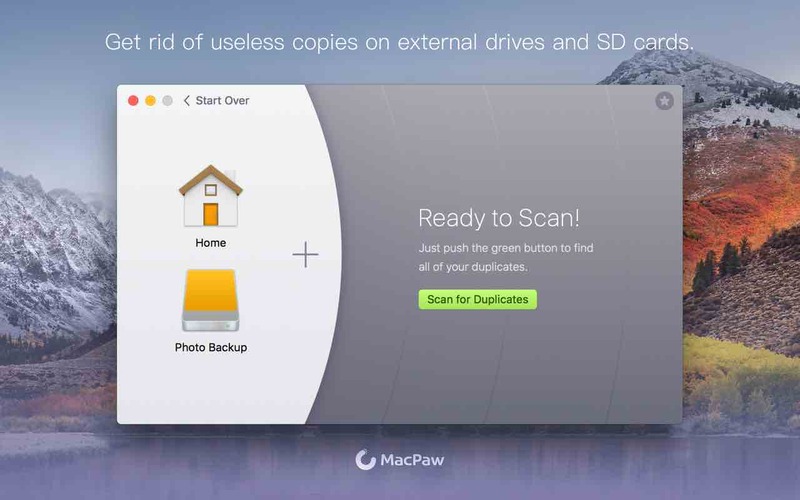 So, Setapp also has apps for data recovery and backup. Good! For staying ultra-secure, it has Get Backup Pro and for file retrieval from any device. Setapp has an app called Disk Drill. While literally drilling hardware for data recovery would be a cool thing to watch, we're not there yet! 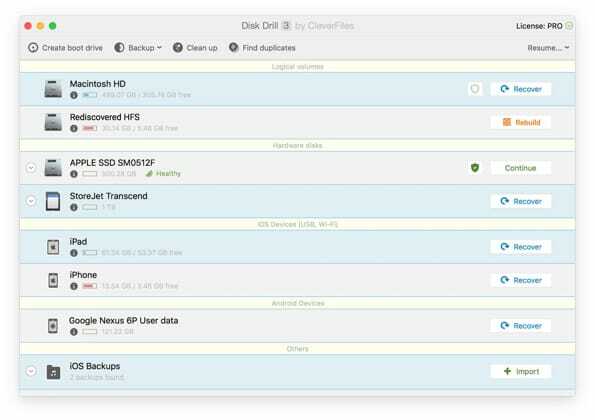 🙂 Disk Drill can recover a file from phones, flash drives, and SD cards. 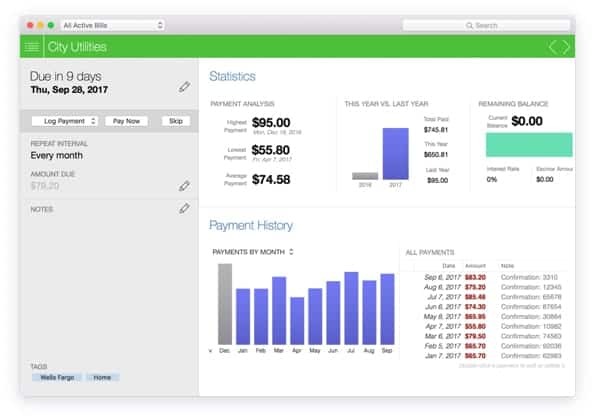 Budgeting apps like Moneywiz and Chronicle help you with your budgeting needs. 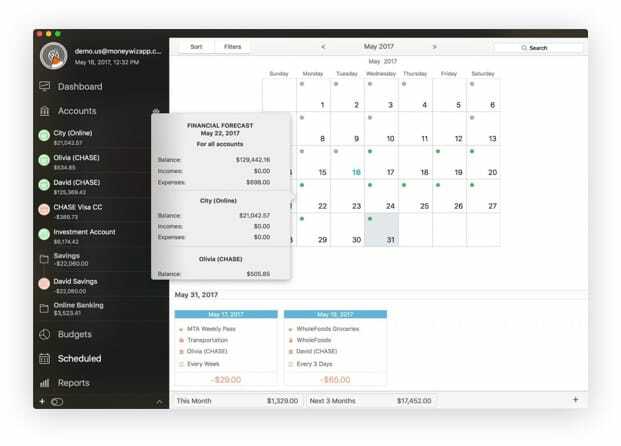 You can easily track your bills and spending. You don't have to buy expensive software upfront. With no Setapp, if you buy all the listed apps, you would have to pay thousands of dollars - upfront. Many people argue that we don't use that many apps, only a handful of them! 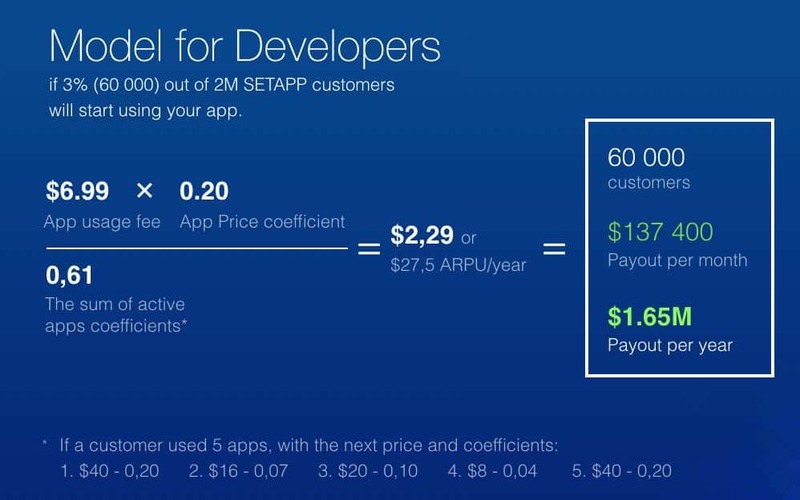 The thing is even if you use 5 apps per month, for example, doing simple calculations suggest Setapp is the winner. You still save a lot! You have access to an increasing number of top Mac apps - curated. 178 apps are listed right now (March 22, 2018), and the CEO of Setapp, Oleksandr Kosovan, is aiming at a max. of 300 apps. So, instead of going through the millions of apps on the App Store and scratching your head, you simply have to go through a reasonably long list of the must-have apps in every category that are handpicked by the MacPaw team. How does Setapp select apps? I just got to know through their chat support that their app-hunt process is simple. They just go through the feedbacks and popularity of apps. If Setapp doesn't have a similar app, they contact them with their offer. No Ads. No extra costs for the premium experience! Setapp allows no advertising. And, you get the full-paid or pro or premium versions of all apps without having to pay for them individually. Now, this is super cool. This is value! As an average Mac user, this gives you a lot of relief. If I don't want an app right now on my Mac, but I plan to use it later, I simply have to click it to get it - the latest and premium version of it - on my Mac. I don't have to worry about the costs, the updates or upgrades, or even the passwords! One less thing to worry about each day! Free trial followed by invites! 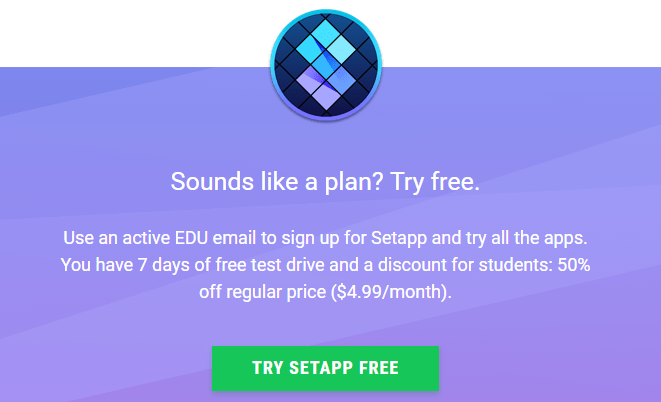 Anyone can sign up for a 7-day free trial of Setapp. No credit card required. The subscription can be canceled at any time, free of charge. Not just that, you can also extend the trial period up to half a year. All you need to do is invite a friend to join Setapp. If one person joins Setapp on your invitation, you get one-month free access to Setapp. You can invite up to six people through your personal online Setapp account. Easy to find, download, and use apps. Setapp is easy to use, and finding apps is hassle-free. Apps are sorted into different categories. The search bar is also effective and gives you realistic and relevant results. So, you can easily find, download, and use an app within no time. You can also present Setapp as a gift. This is another cool feature that they have probably included recently. In the 'Gift cards' section of your online user account, you can simply choose a suitable subscription option and confirm the purchase of the gift card. You'll get a gift card code that you can share with anyone you want to present Setapp as a gift to. They just need to login to their Setapp account to use the gift card code. The support team has promised to improve the functionality of this feature in the near future to make it even more easier to use. It feels good to know that Setapp offers a 50% discount for students, because, as they have rightly put, academia is no picnic. All you need to avail this discount is an active EDU email. Setapp apps are safe to use. Since the apps are handpicked and every app has to go through a number of tests by the 'Review team' at Setapp who check the apps for quality, functionality, safety, and privacy among other things, we can trust them. Scanning the software may also help build trust. You can read more about it in this Setapp support article. Uninstalling Setapp and Setapp apps is easy. You can simply drag an app to the Trash to uninstall it. Alternatively, you can uninstall an app through the Setapp window. If you want to uninstall Setapp, you can do so by simply clicking the Setapp Menu icon at the upper left corner and then going to Help > Uninstall Setapp. Image Credit: Setapp and CultofMac. According to TidBITS, Mac developers get 70% of all revenues and the 20% of the remaining 30% as a partner fee. For more details, you can visit the Setapp developers page from Menu >> For Developers. Setapp has changed the way people approach apps - to a certain extent. However, it is far from perfect, and there are several areas of improvement. After going through Setapp and some of their online reviews in the last year, I have listed a few areas of improvement below. You can also suggest more. Setapp can and should introduce packages for families and businesses. I don't see a major hindrance here. MacPaw CEO had announced that he wants 300 apps at max. Right now, over 110 apps are listed in Setapp. So, more high-quality, high-value apps need to be added to Setapp asap. The more the apps, the more the chances of success. 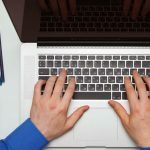 As for the developers side of things, in his Setapp launch article Jan 25, 17, an important question is raised by John of MacStories, that should be answered by MacPaw. Through effective business development initiatives, Setapp can convince some big guns to hop in. This will be a huge plus, and it can be the game changer! 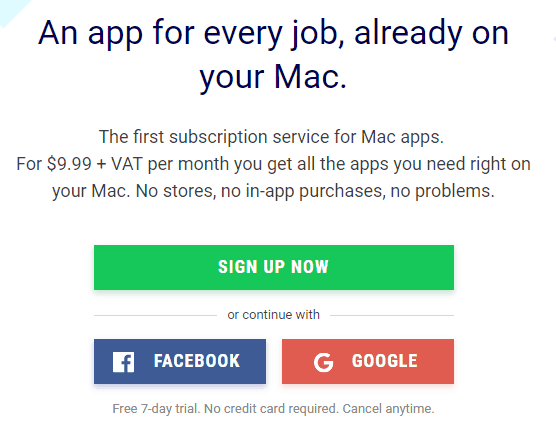 With 'quality' and 'value' of apps geared up, an average Mac user will find it very hard to resist the subscription service. 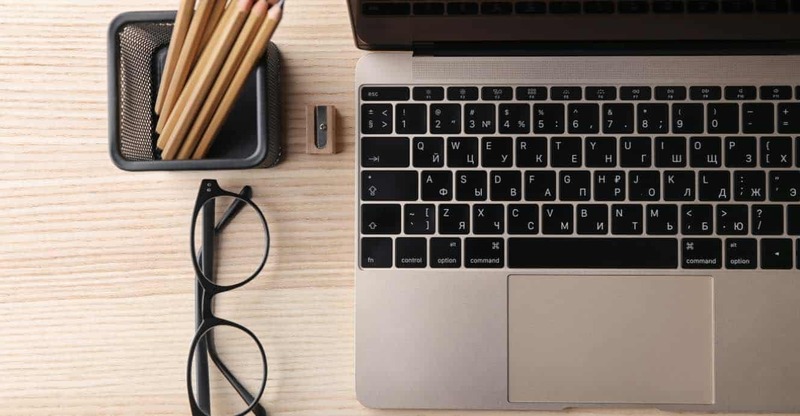 A look at Statistica and AppAnnie trends reports might help MacPaw better understand the changing landscape and the pressing need of gearing up! Mac App Store: A vast collection of apps - mostly for sale. Discovering apps is not as easy as with Setapp. Microsoft and Adobe subscriptions: We are aware of this 'a tad expensive' subscription model that will give you the app you need. With Setapp you have more options as it has brought many developers on board and is offering apps in many categories. Mac-bundles: Very similar business model. With Bundles, you can save some money, but the apps you get may not be full-featured. With Setapp, you always have the premium experience, at arguably, a slightly cheaper price. The latest version of Setapp, as of writing these lines, is 1.10.5. How do I know this? They have a super-fast live chat support. I asked them a question to check their turnaround time, and they replied within a minute! (The image below says 6 min, but it was under one.) Unbelievable! PS: I asked another question some 5-7 hours later and again, Maria, the support girl, replied within a minute! Another 16-19 hours later, I got a response within 3 minutes from another guy. So, it is 5/5 for live chat support in terms of responsiveness. English is not the first language of the support 'team,' I suspect! But, hopefully, you'll get the point. This review (Setapp Review - March 2019) ends here. I'll appreciate your thoughts and suggestions about this review and the app subscription model. 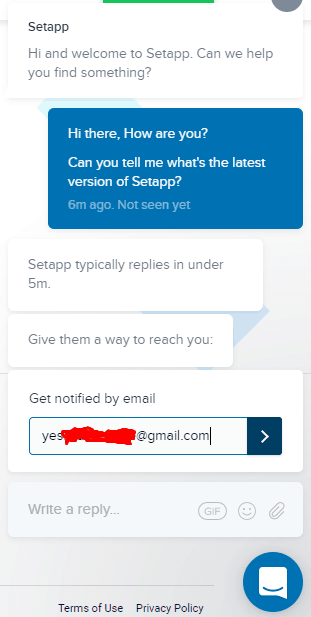 Let me know your experience with Setapp. My biggest question is what happens to my data if I stop subscribing to SetApp? Say I record my days in the Journey journal, add recipes to MacGourmet Deluxe, set up tasks in 2Do and use one of the mind map apps, then 6 months later stop subscribing to SetApp. Without those apps you would no longer have access to all that data. 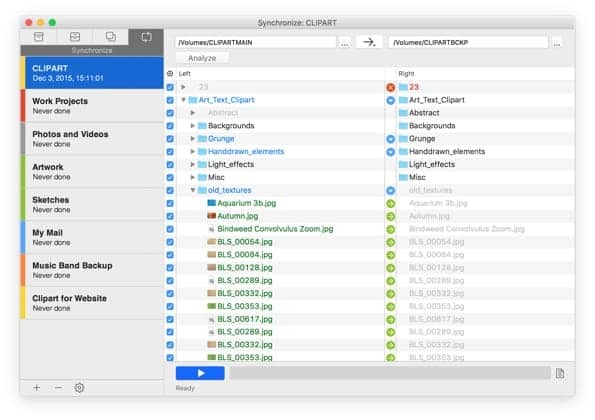 SetApp might be great for apps you want to use occasionally for maintenance or a specific task like finding duplicates or downloading files but it doesn’t seem viable if you are using an app to store data.